Necklaces for babies made from genuine amber is a natural and effective tool for painless teething. When your child starts to develop his or her first teeth, it becomes, in all senses, painful issue for both children and their parents. The teething process is inevitable, so the only remaining option is to use various methods to mitigate those unpleasant sensations. If your child has these symptoms, amber necklaces will come to your kid’s rescue. This method is already quite common in Europe, although we cannot call it innovative. After all, the use of amber necklaces to help children’s teething was well known for a long time and tested by many generations. Why amber necklaces are so beneficial for baby’s health? As it is widely known, amber is a fossilized hardened resin of pines and fir-trees. There are several kinds of it. First of all, teething amber necklaces are useful because they secrete succinic acid, an amino acid of natural origin. It improves cellular respiration and enriches body’s cells with oxygen, all while slowing down decay of the red blood cells. Necklaces made of amber improve metabolism and speed up body regeneration, reduce pain, which is very helpful for teething. Therefore, natural Baltic amber reduces the severity of general teething symptoms and overall has beneficial effects on the baby's body. How do children's amber teething necklaces differ from other similar products? Only Baltic amber has all of the above properties. Artificial amber, as well as other varieties are completely useless. Additionally, you should buy baby amber teething necklaces for babies because it is an absolutely harmless product. All amber necklaces undergo special refinement to ensure their durability. Screw clasp is used to prevent your child from being able to take it off. Each bead is held by a knot, so even if the child manages to tear it apart, beads will not crumble and will stay secured in their places on the thread. All amber teething necklaces that we offer are handmade, which means that all parts are carefully screened to make sure that the product is safe for your child and is comfortable to wear. It is important to remember that a child can only wear teething necklaces strictly under adult supervision. You must not leave your baby unattended while he or she is wearing the necklace, and the necklace must be removed before putting your baby to sleep. Amber teething necklaces are worn around the baby’s neck or wrist. Upon skin contact and with the help of human body’s heat, amber releases materials that interact with the human body. However, do not let your child chew on the necklace - they are not made for chewing. Amber beads are recommended for teething children aged from 2 months to 3 years. Where to buy Baltic amber, if not at the coasts of Baltic Sea? 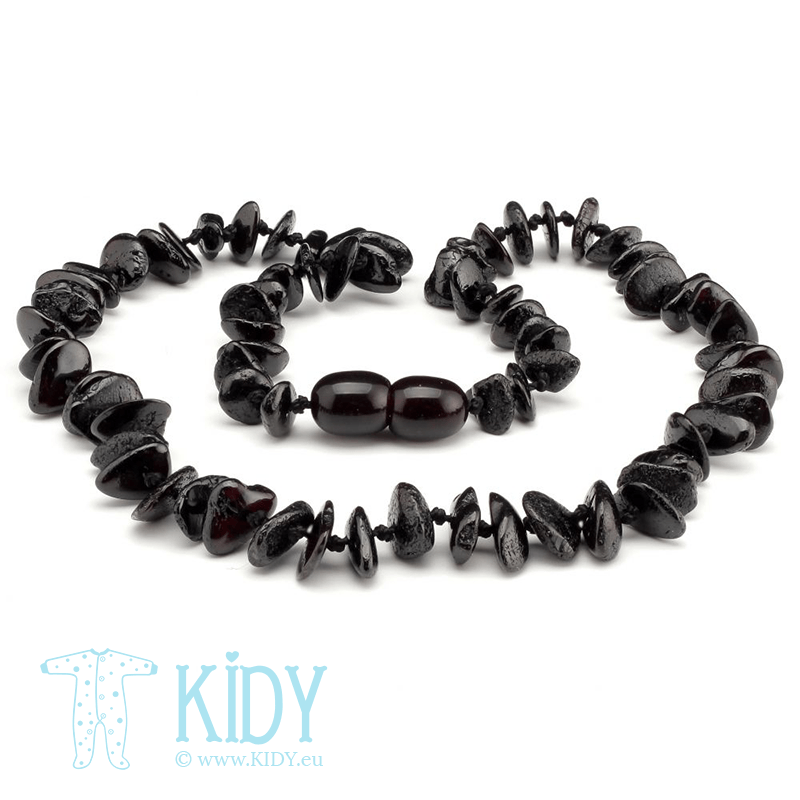 That is why we offer you to buy children's amber teething necklaces at our online store located there. We guarantee that the product exactly matches its description, has great quality and is genuine amber, and therefore without a doubt healthy, and we can prove it by providing you proper certificates with the purchase.